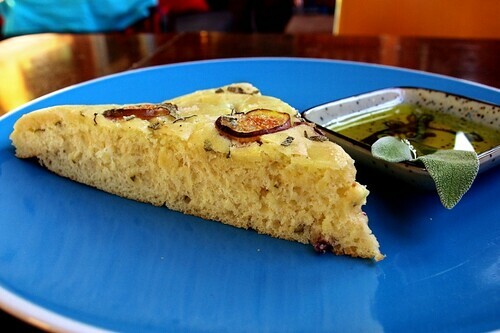 rubbed sage and fresh black mission fig focaccia, originally uploaded by aarn! +18th August, 2009+. mixed 3c. of flour into 1 2/3c. room temp water, 2 1/4t. table salt, 1 1/2t. instant yeast, 2t. sugar, 5T. extra-virgin olive oil, and 2 1/2T. sage leaves (chopped up somewhat small and then rubbed in the palm of your hand until it smells nice). folded into the dough three fresh black mission figs, which had been cut into thin rounds cross-wise and then quartered (so as not to destroy the fig matter or make a fig-tasting dough). let the dough sit oiled in a bowl for one hour, then transferred to an oiled baking sheet and made finger indentations every two inches in a grid like pattern, and let rise for an additional hour. topped the dough with three more fresh figs, cut into rounds crosswise, more fresh chopped and rubbed sage, and some extra coarse sea salt. baked in a 400-degree oven (with a water bath in the bottom...a pyrex measuring cup filled with 1/2c. water, placed directly on the bottom of the oven) for 10-minutes, then rotated and baked for another 7-minutes or so, until lightly browned, but not crispy on the bottom. during baking, a plastic condiment bottle was used to squirt water on the walls of the oven every few minutes or so. the water bath was removed after the first 10-minutes. moved the bread from the baking sheet to a large cooling rack and brushed the top with the white of an egg. I tried this lat weekend, it was so good!